Scion Clutch Line. Aftermarket Stainless Clutch Line for Scion FRS, tC, xA & xB. Scion Stainless Clutch Lines by Agency Power & Goodridge will improve fluid transfer from the Clutch Master Cylinder to Slave Cylinder for response and feel. Description: SCC-110 Technafit Stainless Braided Clutch Line for 05-10 Scion tC. D.O.T. Certified Stainless Steel Braided Clutch Line can be made with in variety of PVC protective hose covering: Clear, Smoke, Black, Blue & Red, for NO charge! 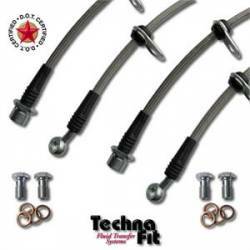 Description: SCC-100 Technafit Stainless Braided Clutch Line for 04-06 Scion xA / xB. D.O.T. Certified Stainless Steel Braided Clutch Line can be made with in variety of PVC protective hose covering: Clear, Smoke, Black, Blue & Red, for NO charge!